Esri India Technologies Ltd is India's leading Geographic Information System (GIS) software and solutions provider. 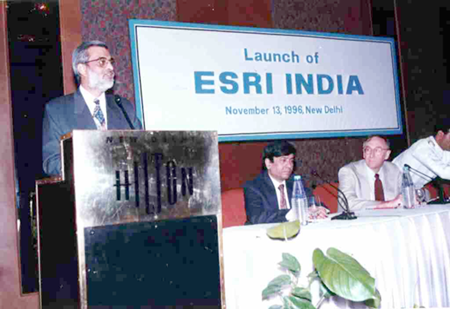 Established in 1996, Esri India today is present in multiple regional offices across India with corporate headquarters in Noida. For almost 2 decades, we have worked with thousands of customers, across a diverse range of industries such as Government, Academia, Defence and Private Sector helping them make timely, informed and mission-critical decisions by leveraging the power of geography. We offer solutions to customers across India, Nepal and Bhutan. As market leaders for GIS in India, we use cutting-edge technology to deliver valuable location-based intelligence to our customers – a process that helps them to see more and do more with their information. We deliver proven solutions based on Esri technology that transform how organisations identify opportunities and unlock potential. We also distribute GIS products from Schnieder Electric (ArcFM), Harris (ENVI) and other vendors. Our solutions are scalable, open and built on a platform that provides the foundation to deliver enterprise-wide GIS. Esri India adheres to major global benchmarks and standards having secured the ISO 9001:2008 certifications and the ISO 27001:2013 Information Security Management accreditation. Awards and accolades have been an important part of our organization’s success story. The company has bagged several recognitions including being the winner of GIS Solutions Company Award (instituted by GIS Development India) for 2 consecutive years and recipient of multiple High Achievement Award from Esri Inc.
Our open culture, flat management structure and innovative Human Resource practices have made us the Most Preferred GIS Company to Work for and Preferred Employer of Choice, as rated by GIS Development. Esri India Partner community includes Organisations/Partners who develop and deliver cutting-edge geospatial solutions and services based on Esri technology. Our partner program connects organizations developing GIS solutions and offers a wide range of resources to them. We have a global network of more than 2,000 business partners which develop and deliver real solutions to solve tough geospatial challenges.